Many colored gemstones in the market have been treated or enhanced by various methods, including heat, irradiation, diffusion and fracture-filling. The reason for these treatments is that high quality gem material is scarce, and the gemstone industry makes every effort to get the best yield from whatever material is mined. Gem treatments are well accepted in the trade, but it is very important that they be disclosed when a gemstone is offered for sale, since these enhancements can affect the value of the gem or require special care. In the case of fine gems, the usual practice is to provide a test report from an independent gemological laboratory. The best gem labs have sophisticated equipment that can reliably detect a wide range of treatments. However, it is important for consumers to understand that there are limits to current gemological testing. Not every kind of gem enhancement is detectable using state-of-the-art instruments, even though advanced spectrometers can do very precise analysis of the chemical composition of a gemstone. A gem enhancement will be undetectable if there is no trace from it measurable in the lab. 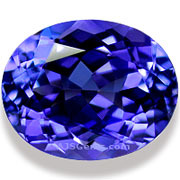 Low temperature heat treatment (under 800 degrees centrigrade), for example, can improve the color of certain gems, such as aquamarine, tanzanite, blue zircon and apatite. But these temperatures are not high enough to cause melting of inclusions such as rutile, so this treatment is very difficult or impossible to detect under the microscope. Irradiation can change the color of some gemstones by rearranging the position of electrons in the crystal lattice. The color of blue topaz, for example, is produced by irradiation and subsequent heating. This treatment is not detectable by current technology, though GIA (Gemological Institute of America) is researching ways to detect irradiated diamonds. When a treatment is not detectable, there is no premium in the market for untreated material. 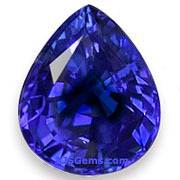 For example, most tanzanite is heated at low temperatures to produce the distinctive violet blue color (unheated tanzanite is typically brown).There may be some tanzanite in the market which is not heated in this way, but the price for the untreated material is the same as the heated stones, since it is generally impossible to verify that a stone has not been heated. The situation with sapphire and ruby is quite different. Most of these gems are typically heated at high temperatures (over 1500 degrees centigrade) to dissolve inclusions and improve the clarity and color. This treatment is easily detectable under the microscope by experienced gemologists. High quality unheated ruby and sapphire sell for premium prices, often 50% more than the price of heated material. Finally, it should be noted that there are a number of gem species which are not treated in any way, including several of the finer gem varieties. Spinel, for example, a close relative of sapphire and ruby, is always untreated; and spinel has become a great favorite of gem dealers and collectors in part for that reason. All of the garnet varieties, including rare garnets such as tsavorite, spessartite and demantoid, are not enhanced in any way. Tourmaline is usually untreated, though some specimens may be heated at low temperatures to lighten the color. Alexandrite and the other forms of chrysoberyl are also untreated.